Visit North Cyprus for an early summer holiday, and you'll be struck by the sheer numbers of festivals taking place during your stay. Festivals are at the heart of cultural life in North Cyprus. All the towns and villages in North Cyprus hold them, even the smallest mountain villages, so you'll usually need to hire a car in North Cyprus to join in the fun! Festivals in North Cyprus have become extremely popular over the years, often featuring different cultural events. 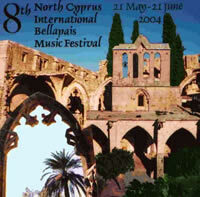 Most North Cyprus cultural events take place in historical locations such as Kyrenia Castle, Othello's Tower, Bellapais Abbey, and the Salamis Amphitheatre. If there is one on at the time of your holiday, book your tickets early, and enjoy some excellent entertainment in magnificent surroundings. Since some of these historic locations are out of town, a North Cyprus hire car from Pacific Rent A car will be invaluable and more reliable than a taxi or bus late at night. During the months of April and May, the atmospheric ruins of Bellapais Abbey are filled with glorious music, as musicians from all over the world come to play in the magnificent Refectory hall. This really is an unmissable event for any classical music fan, and with a hire car from Pacific Rent A Car, you can drive yourself home afterwards to save on expensive taxis. Famagusta is another place to visit for cultural activities and here you can find a number of different musical events also. Famagusta hosts an annual music festival where you can listen to a wide range of musicians. When visiting any event in old Famagusta, it's best to park your North Cyprus hire car outside the massive city walls, and walk in through the gates. In North Cyprus one of the most important things is family life and whenever Turkish Cypriots have time off, it is spent with family. Most of the time this is in the form of family gatherings and these are a big deal where the entire family go out together. If you love spa holidays in North Cyprus, then a visit to a traditional hamam is an absolute must. Originally built by the Ottoman Turks, every major town in North Cyprus has these public baths, with separate baths for men and women.When you enter the hamam you are wrapped in a towel, then make your way to a large heated headstone that is located in the middle of the room. This is very similar to a steam room, and here you sweat whilst being rubbed down by one of the bath attendants. Some hammams are in superb locations, such as the Grand Bath (or Buyuk Hammam) in Nicosia which is housed in a former church! Often, you won't even need to drive your hire car to a hammam, as most resort hotels in North Cyprus have them on site, and it is a very refreshing way to spend an afternoon. Experience the best cultural events in North Cyprus with a hire car from Pacific Rent A Car - book now online and save 15%!